"Unlike reverse osmosis, forward osmosis hardly requires energy"
Everything starts with good starting water. Forward osmosis is a new technique for achieving clean irrigation water. If you separate two liquids through a membrane, water passes through the membrane if the concentrations of dissolved substances (salts) are different. That's because the dissolved substances attract water. This process continues until the concentrations on both sides are the same. For this you need a membrane that only allows water to pass through it and not the salts. This process is called osmosis. "In fact, forward osmosis is actually plain osmosis. But a new term has been invented because reverse osmosis is very well-known in horticulture. That makes it clear that this is something else", says Nienke Koeman with research company KWR Water. The company explores new purification techniques without the drawbacks of reverse osmosis. "That requires a relatively large amount of energy and, what's more, it causes the groundwater to have a higher salt concentration in many places, making it more difficult. Forward osmosis in contrast hardly requires energy," she says. In this technique, you make use of the fact that a fertilizer solution (such as the A and B container) is already highly concentrated. This means that such a solution has great pulling power; in the case of the manure containers this is 47 bar (A container) and 31 bar (B container). That pulling force is a physical certainty, and you do not have to use energy to generate it. In the forward osmosis installation, the nutrient solution is on one side of the membrane and the water source on the other side. This can be ground or surface water, but also drain water. Through the osmosis process the water flows to the other side and thickens the water source. Undesirable substances, for example NaCl, are left behind. "Forward osmosis is an innovative technology that is still under development. One of the points that is being worked on are the membranes. Thin enough for sufficient water flux, thick enough to stop salts and possible pathogens. The development continues, so that they leak less salts," she continues. A test was conducted in a test greenhouse of Wageningen University & Research. A trial at a horticultural company is not planned yet. 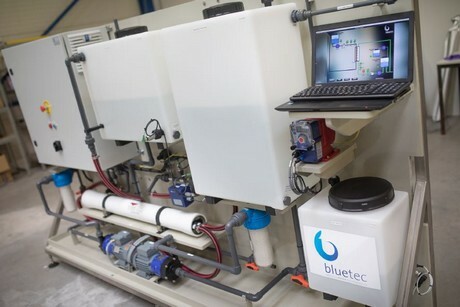 The prototype of the installation comes from Blue-tec, a company that previously was not active in horticulture, but rather in the food industry and wastewater treatment. And what do you do with the thickened polluted water? Koeman: "If you start with surface water and you condense it just a bit, for example twice, it might still be discharged in the ditch again. If you condense it a lot, you'll get a kind of brine. You have to discharge that in a different way." The project is being carried out by the KWR Watercycle Research Institute and Wageningen University & Research and financed by the Foundation Program Greenhouse Horticulture, Top Sector Water, Top Sector Horticulture & Starting Materials and Blue-tec.